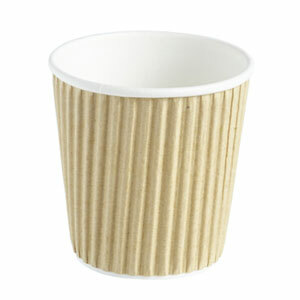 These Kraft Ripple Disposable Paper Coffee Cups are the popular option for takeaway hot drinks and are perfect for coffee, such as an Espresso or Americano. These triple walled cups have 3 layers of board, which keeps your beverages warmer for longer and the insulation makes for safe handling. "Perfect size and good quality"